The Randy Report: U.S. 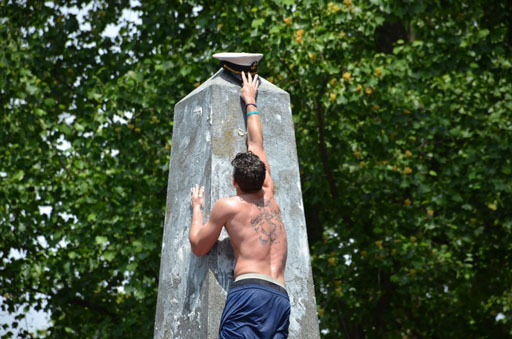 Naval Academy: It's Herndon Climb Time! U.S. Naval Academy: It's Herndon Climb Time! Ah yes, it's that time of the year when "Plebes," having reached the end of their first year at the U.S. 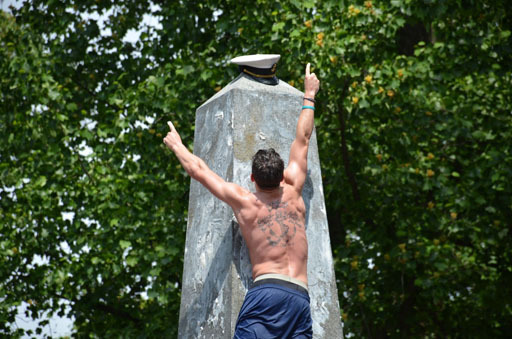 Naval Academy in Annapolis must climb the lard-laden Herndon Monument and replace an underclassman’s hat at the top of the monument with an upperclassman’s hat. Only then can they begin their summer. Last year’s freshman class accomplished the feat in one hour, 38 minutes and 36 seconds. Bianchi hails from Virginia Beach, Va. His tattoo features his father’s name, the words “God,” “Family” and “Country,” and a chapter and verse from the Gospel of John (“Greater love has no one than this: to lay down one’s life for one’s friends”). After a couple pushes, he nudged the upperclassman’s hat onto the top.